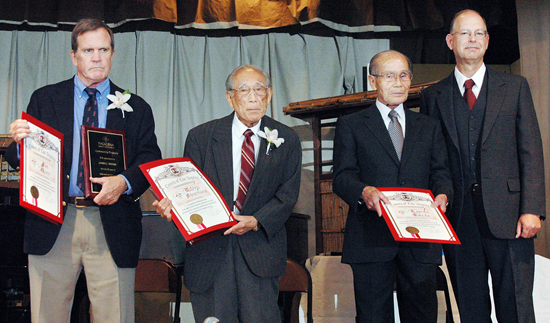 The Pasadena Japanese Cultural Institute held a luncheon gala on Sunday to commemorate the institution’s 50th anniversary. Hundreds filled the newly-remodeled gymnasium at the Pasadena Buddhist Temple in northern Pasadena for lunch, greetings and the presentation of four individuals whose leadership and dedication have enriched the JCI and the community at large. Pasadena JCI member Bryan Takeda introduced the “Community Treasures,” one of whom is his father, Kiyoshi Takeda. With more than 45 years of service to the community, the elder Takeda served as the Pasadena Kendo Dojo president for 15 years has been the president of the Pasadena Nikkei Seniors for the last 25. He has also led the Parent Teacher Association of the Pasadena Japanese Language School, been an officer for the Crown City Gardeners Association, and has been instrumental in community events and celebrations. James C. Moore has served the Pasadena JCI for more than two decades, as a board member and aikido instructor. Moore has also been a key advisor to the center for office and facilities management. Unable to take the stage to accept his commendation personally, Maki Miyahara was recognized for more than 60 years of teaching martial arts in the Pasadena area. A native of Montebello, he served with the famed Military Intelligence Service during World War II and later contributed his mechanical expertise to facilities at the Pasadena JCI, Higashi Hongwanji Buddhist Temple and Zenshuji Soto Mission. 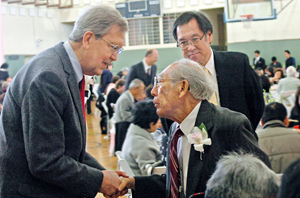 In July 2011, Miyahara was honored by the Japanese government with the the Order of the Rising Sun, Gold and Silver Rays, for his contributions to kendo and U.S.-Japan relations. Sameshima joins “Community Treaure” honorees Jim Moore, left, and Kiyoshi Takeda, with Pasadena JCI President Rick Beal. With over 20 years of service and leadership to the PJCI, including over 20 years as a board member and two terms as PJCI president, Hitoshi Sameshima was the fourth Community Treasure lauded on Sunday. Instantly recognizable at community events both locally and across the nation, the World War II veteran is a member of VFW Post 9938 and the 100th/442nd MIS Go For Broke Foundation, and has served as the president of the Military Intelligence Service Association of Southern California. Devoting decades of service to organizations such as the Crown City Optimists and the Pasadena JCI, Sameshima can often be found volunteering as a docent at the Japanese American National Museum in Little Tokyo. Also attending the event was Yusuke Shindo, the deputy consul general of Japan in Los Angeles, who said organizations like the Pasadena JCI are fundamental in building sound relationships at home and across the Pacific. The Pasadena Pioneer Project received the PJCI Community Award for its local involvement, and the Amy Utsunomiya Memorial Youth Community Service Award recipients, Harrison Jung and Noah Branson, were introduced. Bryan Takeda explained even though Japanese Americans tend not to be bound together by Japanese language, the community nonetheless has much to share. Thank you for this wonderful article to help celebrate the 50th Anniversary of the Pasadena JCI.